Despite all the bells and whistles being added to today's HDTVs - things like streaming video, built-in WiFi, and voice/motion control - it turns out that the number-one thing most people care about is still picture quality, with sound quality coming in a strong second. Consumers worldwide still consider picture quality, sound quality, price, and ease of use to be most important to their upcoming replacement TV purchase decisions. 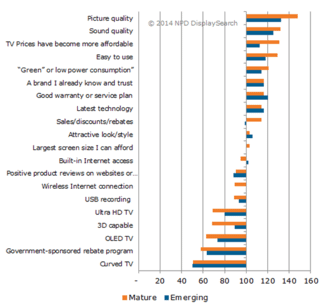 According to the NPD DisplaySearch 2014 Global TV Replacement Study, picture quality is the most important feature for consumers in mature markets making an upcoming replacement TV purchase, with an importance index of 148. Sound quality follows closely, with an index of 132 (the index compiles responses rating a driver "important" or "most important"; scores above 100 indicate relatively high importance). Price and ease of use ranked nearly as high as sound quality in mature markets, but in emerging markets having a good warranty or service plan ranked higher than both of those. "To improve market success, TV brands need to focus not only on improving the features that resonate with consumers but also on clearly communicating those benefits," said Riddhi Patel, research director of consumer insights for NPD DisplaySearch." While Ultra HD (also known as 4K) relates to higher picture quality, it is not as important to consumers' purchase decisions because it carries a significant price premium in most markets and conflicts with their desire for lower prices. "Given that picture quality is the most important driver, it would benefit brands to increase consumer awareness about how Ultra HD improves the picture quality. The same could be said for OLED," Patel said. Consumers in emerging markets are expected to drive the next round of demand, with more than 30% planning to purchase a TV in the next 12 months. Increasing awareness and availability of flat panel TVs and declining prices are the key drivers of TV replacement. The TV replacement cycle is similar to last year, approximately eight years in mature markets and six years in emerging markets, which can be attributed to two primary factors. First, the majority of legacy sets in household inventories have already been replaced as part of ongoing replacement cycles. Second, in most countries the transition to digital broadcast has been completed, and there are few compelling reasons for consumers to replace existing TVs. Change in the replacement cycle has been under 10% Y/Y for most mature markets, which indicates slowing demand. "With CRT TVs accounting for only about 20% of the household inventory in emerging markets, there are very few units left to upgrade," Patel noted. "Add that to the fact that consumers do not see enough value in the new TV features and we could see replacement cycles slow down in the coming years."